As its name suggests, the finless porpoise lacks a dorsal fin. Instead the animal possesses a ridge, or “groove”, that runs down the middle of its back (as seen above). 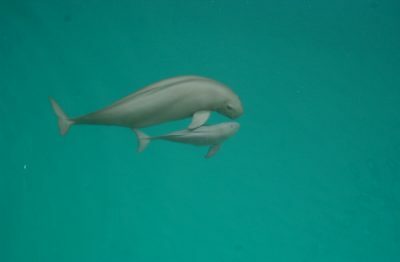 This mother and calf pair is located in a semi natural reserve in the Yangtze River, China Presently there are 25 porpoises in the Shishou semi-natural reserve and 6 in the Tongling semi-natural reserve. All are reported to be healthy and the population is reproducing. Photo courtesy of Xiaoqiang Wang, IUCN. Finless porpoises are one of the lesser-known small cetaceans. They inhabit shallow, coastal waters in the Indo-Pacific region, ranging from the Persian Gulf to coasts of India, China and Korea, and Japan. This species is also found in estuaries and large river systems. Characteristic of all porpoises, finless porpoises possess spade-shaped, or spatulate, teeth. They are considered opportunistic foragers that feed on a variety of prey including fish, squid, octopus, and shrimp. They are traditionally observed in groups of 2-3 individuals and usually do not form large pods. There are 3 subspecies of finless porpoise, two are marine and one is freshwater: N. phocaenoides phocaenoides lives in the Indian Ocean and South China Sea; N. phocaenoides sunameri lives near the coast of northern China; and N. phocaenoides asiaorientalis lives in the Yangtze River and associated oxbow lakes in China. It occurs in the same sections of the Yangtze River where the baiji, which is now extinct, also lived, and faces the same range of threats as the baiji did, including fisheries bycatch, habitat degradation, pollution, and vessel strikes. The latest estimates for these finless porpoise suggest that the population has declined drastically over the last 10 years to less than 2,000 individuals (declining at a rate of about 7% per year). Currently, the Yangtze River finless porpoise is classified as “endangered” by the International Union for Conservation of Nature (IUCN) meaning it is facing a very high risk of extinction. 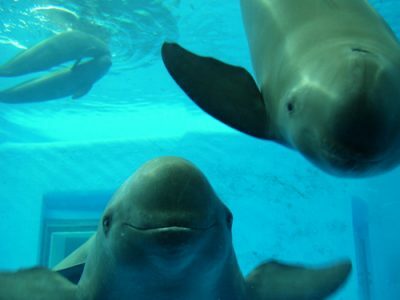 Finless porpoises at the Aquarium of the Institute for Hydrobiology in Wuhan, China. Animals are typically 170cm (5.5 ft) in length and 70kg (154 lb) in weight, although individuals over 200cm (6.5 ft) and 100kg (220 kg) have been reported. Photo courtesy of www.baiji.org. Audiograms of the Yangtze River subspecies show that they have high sensitivity from 45 to 139 kHz, with the lowest hearing threshold around 48 dB re: 1uPa (at 54 kHz). Like other porpoises, echolocation signals are short duration, high-frequency pulses with a peak frequency of about 125 kHz, which are produced about every 6.4 s. Their clicks are similar in both duration and frequency to those of the harbor porpoise (Phocoena phocoena). However, freshwater finless porpoise clicks are markedly higher in frequency than those produced by the baiji. As the two species overlaped in their distribution, one hypothesis for this difference is that the two odontocete species used different frequencies so that their echolocation signals did not mask each other. Alternatively, the frequency differences could have been attributed to the difference in the size of prey preferred by each cetacean species.